Welcome to, the premier hunting preserve in the northeast, located in the remote hills of West Fairlee, Vermont, Wild Hill is truly a sportsman's paradise. The swamps, streams, hills and open meadows provide an ideal natural habitat for game. Founded in 1960, Wild Hill is the oldest hunting preserve open to the public in the northeast United States and one of the oldest in the country. Your host and guide is, one of the most experienced outdoorsmen in America. He has devoted a lifetime to his craft in Alaska, Canada and South America as a hunter, trapper, guide and bush pilot. He developed the property especially for the sportsman who expects something more from his hunt. By traveling a relatively short distance from home, a hunter can leave every day care behind and coexist with nature, testing his skills against his game in a true wilderness setting. We will assure you of an exciting and memorable hunt. Hunts include Russian boar, Red Stag, Elk, Buffalo, Fallow Deer, Ram and wild Goat. Elk are perhaps the most impressive antlered animals on earth. Our Elk come from some of the best blood in the world. We have beautiful, large-bodied, heavy-antlered Elk. You simply will not find our caliber of Elk anywhere else and our prices are unbeatable. Why pay thousands to go out west for a trophy bull just to come out empty-handed or with a cow? We guarantee a shot at a magnificent bull elk worthy of any trophy room. If you do not tag-out, you only pay room and board. 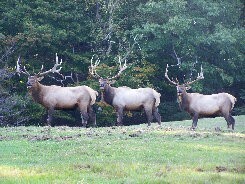 Elk are hunted beginning in September into January. Fallow deer come in four color phases: white, light spotted, darker spotted and chocolate. With their large, palmated antlers and beautiful coats, fallows make a handsome trophy. Venison from fallow has a delicious, rich nutty flavor. European Fallow Buck hunts are in the fall all season long. Russian boar can be dangerous and unpredictable. Renowned for their toughness and tenacity, Russian boar make for an exciting hunt. We hunt only pure Russian boar; they are larger, much better eating and make for a more impressive trophy than the feral hogs found on many other preserves. If you've never had Russian boar meat, you are in for a treat. It is not pork, rather a rich red meat closer to beef in texture with a flavor all its own. Our boar average 200 pounds and are hunted in both spring and fall. European cousin to Elk; Red Stag are a majestic animal. Mature Stags can weigh over 600 pounds and have thick-beamed antlers with a characteristic "crown" of points at the top. Red Stag venison is regarded as some of the most delicious in the world. The popularity of Buffalo hunts continues to grow at Wild Hill. Magnificent and awe-inspiring; they are truly a sight to behold. Buffalo meat is higher in protein and lower in fat and cholesterol, offering a healthier alternative to beef. Buffalo are hunted in both spring and fall. A full-curled horn and a thick mane make a beautiful trophy mount. Wild Hill has five species of ram including Texas Dall, Hawaiian, Corsican, Mouflan and Rocky Mountain. We also have Spanish goat. Ram and Goat hunts begin April 15th in the spring and run all through the fall. Mouflon Ram, Corsican Ram, Rocky Mountain Ram-$750. We have an experienced butcher who processes your game to your specific demands for an additional fee. Seven meals are included with your stay. Meals are served family style and you will want to come back for seconds of our Vermont home cooking. We frequently serve wild boar, buffalo and other wild game. A main lodge that sleeps thirteen and a separate cabin that can sleep eight completes the sleeping quarters. Both have spring-fed running water, bathrooms, heating, hot water and battery operated lighting. There are two ponds near the main lodge teeming with rainbow and brook trout. Fishing is available in the larger pond so don't forget to bring your rods. Professional, experienced taxidermy services are available. Your guides are all experienced woodsmen, well acquainted with the terrain and the game you are hunting. They work to ensure that you get the game you are after.